A stunning and luxurious high-rise condominium complex, Bellevue Towers in Bellevue, Washington presents homebuyers with a chance to live in a premier home in north-west Washington. Offering incredible amenities, deluxe features, and amazing views of the surrounding city and ocean, Bellevue is an amazing real estate opportunity for homebuyers interested in living in the pinnacle of luxury. Buy a new home in Bellevue Towers and enjoy the incredible amenities that Bellevue Towers and the great city of Bellevue presents. In addition to being an exclusive and amazing real estate opportunity, Bellevue Towers presents homebuyers with wonderful amenities. Buy a home in Bellevue Towers and look forward to enjoying an incredible spa, excellent exercise facilities, and a community room for entertaining large parties located in the Bellevue Towers complex. The city of Bellevue offers plentiful amenities as well, with abundant dining, shopping, and recreational opportunities. Dining options include incredible eateries like Lot No. 3 and Cactus Bellevue Square, two amazing nearby restaurants homebuyers are sure to enjoy. Shoppers can frequent the Bellevue Collection, or The Shops at Bravern, two nearby shopping malls featuring a number of stores and restaurants where homebuyers can enjoy shopping for splendid deals. Buy a home in Bellevue Towers and frequent Bellevue Botanical Gardens or the Bellevue Downtown Park, two beautiful local parks offering great sight-seeing and a relaxing atmosphere. Bellevue Towers offers homebuyers the opportunity to live in an exciting and diverse community. Below are the listings for South Tower. To access listings for North Tower, please click here. While the amenities near Bellevue Towers are incredible, the available condominiums are an outstanding option for homebuyers interested in luxury living. Condominiums in Bellevue Towers range in size from 1,300 square feet to over 6,000, with 1,2, and 3 bedroom units available, so homebuyers can select from a variety of floor plans to satiate their living space needs. The condos offer gorgeous and scenic views, plentiful amenities, and an outstanding and exclusive real estate opportunity. 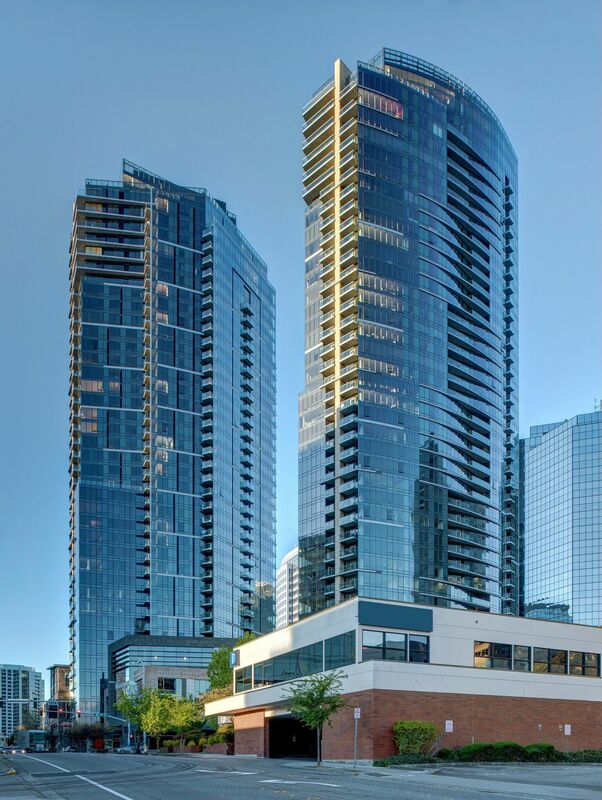 Those interested in taking advantage of the unique and exciting real estate option that Bellevue Towers in Bellevue, Washington presents should not hesitate to contact us today for more information or with any questions they have about Bellevue Towers homes for sale.